Jhabua/Mandsaur(PTI): Farmers in Madhya Pradesh’s Jhabua district today held a “jal satyagraha” protest by entering a pond on the seventh day of the ten-day agitation for various demands including a complete loan waiver. Various organisations of farmers launched a nationwide “Gaon Bandh” (village shutdown) protest on June 1 for various demands including remunerative prices for agri produce, a complete waiver of farm loans. The stir has evoked a mixed response in Madhya Pradesh. Farmers from various villages in Jhabua district stood in chest-deep water in the pond in Gothania village, located about 75 kms away from the district headquarters, and raised slogans while holding placards. Kisan Union leader Mahendra Singh Hamad, who led the protest, said, “Farmers are unhappy as they are not getting good prices for the produce at mandis (agriculture markets). The state government should also increase rates of milk”. A memorandum was handed over to district officials who reached the site of the protest. 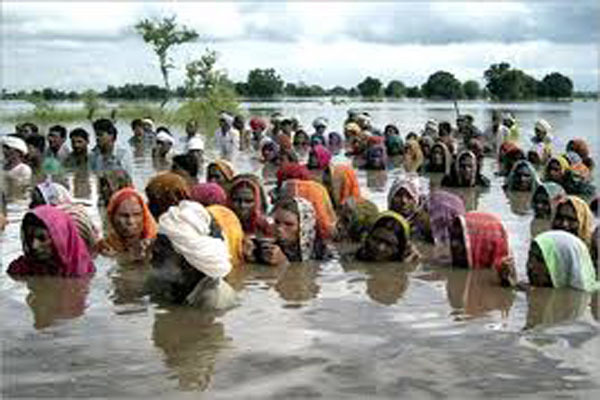 Hamad said the “jal Satyagraha” was a symbolic protest. Meanwhile, more quantity of milk and vegetables arrived today in Mandsaur, the epicentre of farmers’ agitation. Mandsaur Wholesale Vegetable Traders Union president Bhagwandas Meghnani said more than 200 farmers reached the market to sell fresh farm produce. He said rates of vegetables remained stable. Addressing a press conference in Mandsaur, Rashtriya Kisan Mazdoor Mahasangh president Shivkumar Sharma said former finance minister Yashwant Sinha, BJP MP Shatrughan Sinha and former Vishwa Hindu Parishad (VHP) leader Praveen Togadia are likely to arrive in Mandsaur tomorrow for paying tribute to six persons who were killed in the police firing during last year’s protests by farmers. a complete waiver of farm loans.